In the lead-up to the recent presidential elections, Donald Trump called for a complete ban on Muslims entering the United States, surveillance of mosques, and a database for all Muslims living in the country, tapping into anti-immigrant, anti-Muslim hysteria to a degree little seen since the targeting of South Asian, Arab, Muslim, and Sikh people in the wake of 9/11. In the American Book Award–winning We Too Sing America, nationally renowned activist Deepa Iyer shows that this is the latest in a series of recent racial flash points, from the 2012 massacre at the Sikh gurdwara in Oak Creek, Wisconsin, to the violent opposition to the Islamic Center in Murfreesboro, Tennessee, and to the Park 51 Community Center in Lower Manhattan. Iyer asks whether hate crimes should be considered domestic terrorism and explores the role of the state in perpetuating racism through detentions, national registration programs, police profiling, and constant surveillance. 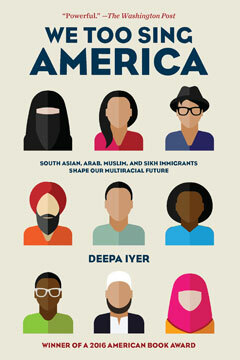 Reframing the discussion of race in America, she “reaches into the complexities of the many cultures that make up South Asia” (Publishers Weekly) and provides ideas from the front lines of post-9/11 America. Deep Iyer is interviewed as Angry Asian Man's "Angry Reader of the Week"